Hurricane Sandy will severely impact the DC Metro area beginning tonight, and extending into the day tomorrow. Adverse conditions are expected until Tuesday. Widespread power outages are anticipated due to the heavy rainfall and damaging winds. Please check in at this LIVE blog for continuing updates! The winds continue to increase in intensity across the area. Lots of reports of damage have already been coming across via Twitter, Facebook and other methods of communication. Expect more damage to continue occurring through the night. Fun fact: Local weather observing stations are closing in on their all-time record low pressure readings. They should attain those records in the next few hours as the center of the storm tracks inland and near the region. Just about everything is shutdown tonight and tomorrow. Feel free to submit your damage reports/photos. Sandy is moving at a rather quick pace towards the west and north. The storm will make landfall somewhere near Cape May, NJ or possibly in Delaware at this rate. The exact landfall location will have very little impact on our sensible weather. We continue to anticipate very heavy rainfall and very damaging winds tonight. Check out this radar image of the center of circulation moving towards the coastline. Radar image of the circulation heading towards the east coast. Power outages continue to rise in the area. 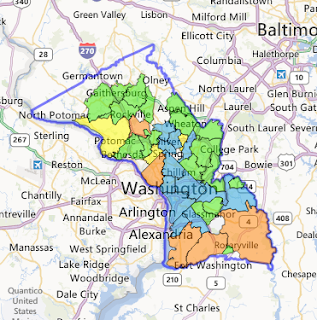 So far, the outages have been fairly slow to rise in the PEPCO region. 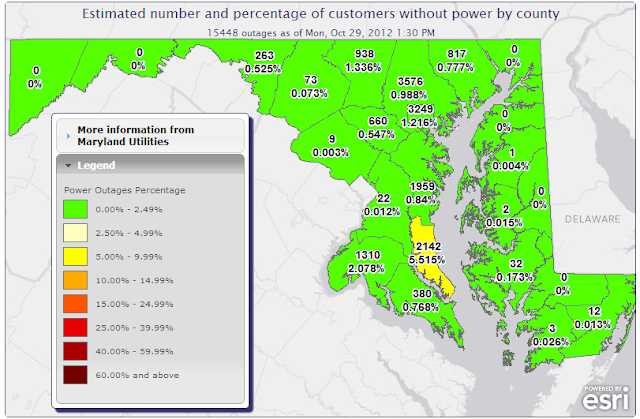 At this time, the highest outage concentration is in PG County in Maryland. Outside of PEPCO, there are high numbers of outages in the Baltimore area as well. Winds could gust upwards of 80mph tonight. DO NOT be outside during the height of the storm. The rain and wind continues around the DC area. Most area school systems have just announced closures for tomorrow. Montgomery Co. Schools in Maryland announced that admin offices will be CLOSED tomorrow as well. Wind gusts are really cranking up areawide at this time. Some gusts in excess of 50mph are being estimated in the area. The winds will peak between 6pm tonight and 6am tomorrow morning. Wind gusts may approach 80mph in spots. Bright red is Blizzard Warning. 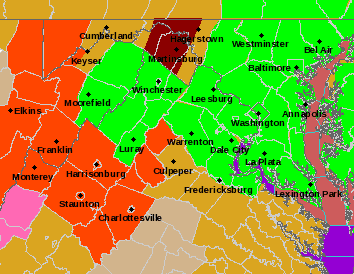 Green is Flood Warning. Some warnings may be obscured. Also, here is a look at a recent radar image taken from GR2Analyst. Notice that there is plenty of rain all around the area. No chance to dry out any time soon. No escaping the rain today in the Mid-Atlantic region. Winds are also on the increase. ALL MONTGOMERY COUNTY PARKS ARE CLOSED. DO NOT ATTEMPT TO USE PARKS OR FACILITIES. This is an extremely dangerous situation. Conditions will rapidly worsen into the evening. Nobody should be out on the roads during this portion of the storm. There have already been fatal crashes reported in the area. If you opt to go out, you are endangering yourself and potential rescuers. You may also be hit by flying debris. THE TIME FOR PREPARATION HAS ENDED. TAKE SHELTER NOW AND DO NOT GO OUTSIDE. TREES WILL FALL AND POWER WILL FAIL IN MANY AREAS. CONDITIONS WILL RAPIDLY DETERIORATE THIS AFTERNOON AND THIS EVENING. Wind gusts are now approaching 50mph in many locations around the DC area. Expect these gusts to increase in intensity. Sustained winds will also rise in speed. Significant power outages will begin to occur quickly. Nobody should be out on the roads - there have been a few fatal accidents already today. DO NOT USE THE ROADWAYS. There is NO MASS TRANSIT operating in the Washington, DC Metro area. Wind gusts may approach 80mph tonight. Hurricane Sandy has continued to intensify this morning. The central pressure is now down into the lower 940mb range. There is a slight chance that the storm will intensify to a category two storm before making landfall. This is an extremely serious situation. You can see from the satellite image below that the storm is producing new convection over the center of circulation. The orange/red colors are new areas of storms near the center. This is a verifying factor in seeing that the storm is still intensifying over water. Extremely heavy rainfall will continue to impact the area. Just about every (if not all) transit services are shutdown over large parts of the northeastern seaboard. Additionally, most schools are closed in the area as well. Recent visible satellite image of Sandy. Just a quick update as clarification - The pier that was destroyed overnight in Ocean City, MD was the fishing pier. The carnival type pier is still intact at last check. Here's a look at a recent satellite image of Sandy as she turns back towards the east coast. Stay safe! Hurricane Sandy intensified somewhat overnight. VERY dangerous storm on the way. An official from Ocean City, MD confirms that the downtown pier was destroyed overnight as Hurricane Sandy lashed the coastline. At this time the boardwalk is underwater and further damage is likely if not certain. Flooding now reported on Conn Ave. between Woodley Park and Cleveland Park. Avoid this area, and DO NOT try to cross flooded roadways. Remember - Turn around, don't drown. 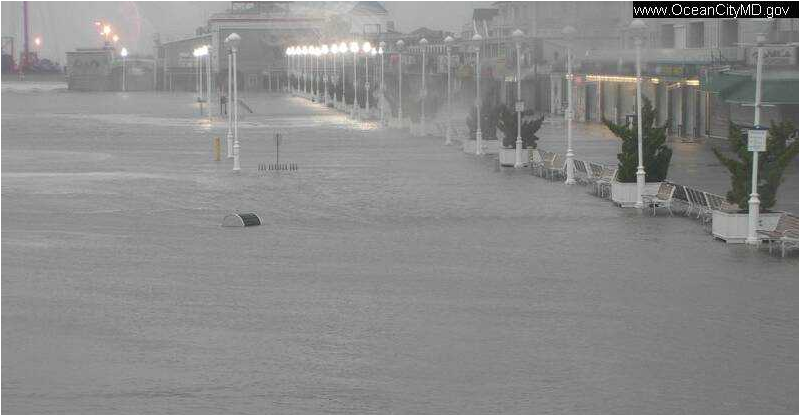 The boardwalk at Ocean City, MD is underwater. Their situation down there will only get worse with time this morning. As mentioned in a previous update, the Fishing Pier in OC may collapse this morning. Webcam from OC, MD this morning. Hurricane Sandy is already throwing copious amounts if rainfall back into the DC area. Some roads are already closed, and most (if not all) flights into and out of the area have been canceled. All Amtrak service in the area has been suspended along the NE Corridor. There is also no mass transit in the area. Most trash collections in the area have also been suspended. The time for preparation is OVER. Prepare at once for extreme conditions and potentially life threatening wind gusts. The strong winds, combined with the heavy rainfall will cause the potential for millions of power outages in the metro areas. Wind gusts on the bay could reach 85mph in spots. This is an emergency situation. The Capital Region Pulse will be LIVE on BlogTalkRadio beginning at 9am ET for weather coverage. Sandy has begun to turn back towards the coast at this hour. It is now only a matter of time before conditions really take a turn for the worst. The Capital Region Pulse cannot stress enough how bad of situation this is going to be. If you were in an evacuation zone and did not evacuate, you have placed yourself and your family at risk. Many locales may cut off emergency response as well if you refused to evacuate. Just look at the vast amount of area the winds cover. This is by no means a "light" situation. Many areas will probably be federal disaster areas by the time this is over. 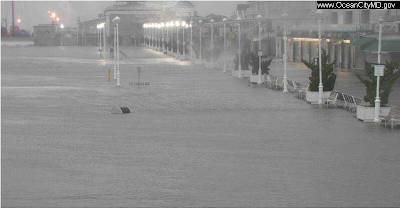 There are also reports that the ocean water is touching the boardwalk in OC, MD at this time. Additionally, reports were received last night that the Fishing Pier in OC is in danger of collapsing today. The time to shop at the store is OVER. DO NOT travel if at all possible during this storm. There is a real risk for flying debris and major flooding. DO NOT drive through a flooded roadway. You may end up with no other options for escape. Winds will increase to 35-45mph SUSTAINED. Gusts will exceed 70mph in spots (especially near the bay). The National Weather Service local warning map this morning. Most (if not all) schools are closed around the area. The federal government is also closed. Most county services have been shutdown and transit services are also not operating today. Most people DO NOT HAVE AN EXCUSE to be out and about today. This is NOT a normal storm. TAKE SHELTER NOW! The Hurricane Hunter aircraft has found Sandy to be intensifying overnight. The central pressure is at 941mb and maximum sustained winds are up to 85mph. 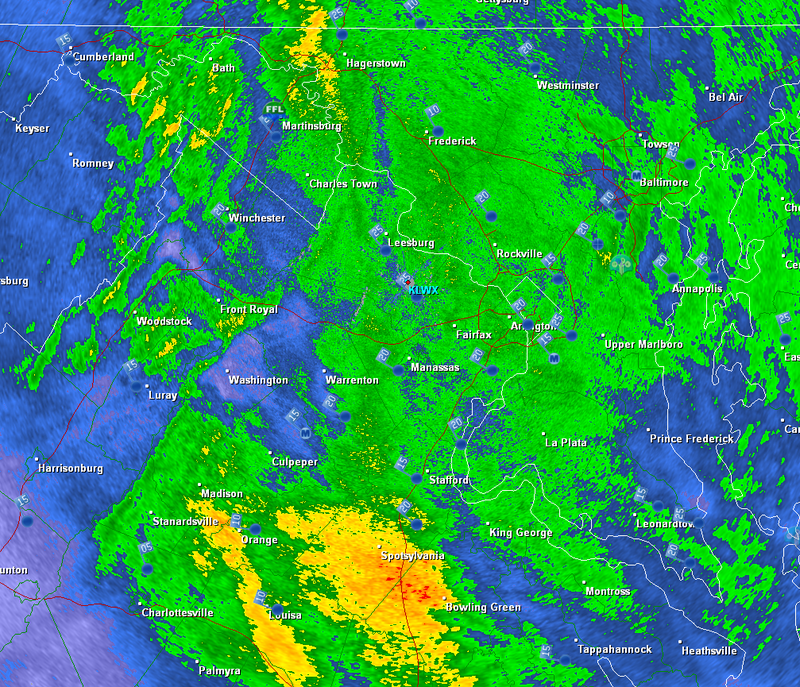 Additionally, heavy rainfall is beginning to overspread the entire DC area. The heaviest rain is still to the east, however. The National Weather Service has increased the wind gust potential - some areas could see gusts of 75-80mph. This is a VERY serious situation - DO NOT TRAVEL today. Around 1,600 customers are without power in the state of Maryland tonight as Sandy approaches. The Capital Region Pulse will continue to provide updated information as the night goes on. Ocean City, MD is reporting that the Fishing Pier may collapse during the next high tide cycle. Delaware Governor Jack Markell has ordered that no one will be allowed on Delaware roads after 5:00 a.m. Monday except for emergency and essential personnel. Radar shows that rainfall is continuing to develop and move into the immediate metro areas. This trend will continue. Additionally, winds will continue to gradually increase through the night. The true damaging winds may not be present until tomorrow morning. Radar around 09:50pm ET - Sandy is well out into the Atlantic right now. So far, there have been NO reports of damage in the immediate metro area. Earlier, there was an unrelated tree branch that fell onto two vehicles in Glover Park. If you see damage where you live, report it to the National Weather Service. Additionally, you may send damage reports to us via the comment section or via Facebook/Twitter. If you have storm photos that you would like to share, submit them to capregpulse@gmail.com - We might post them with your permission! Capital Bikeshare in DC will cease operations due to Sandy at 1:00am tonight. Although...I don't see why it would be a good idea to ride a bike in these conditions. Another thing to note is that DC parking enforcement has been suspended for tomorrow due to the closure of the government. I would strongly recommend staying off the roads after midnight tonight. With Sandy beginning her turn, it is only a matter of time before adverse conditions begin to overspread the area. There was already some minor coastal flooding reported along the bay in spots. Notice on the following satellite image the storm beginning to take a bit of a northerly turn. This movement was expected. This will eventually turn the storm towards the coast. Shortwave-Infrared satellite loop of Sandy. Some light rain has developed across the area. For eastern parts of the area (Eastern Shore etc), heavy rainfall has been ongoing for a good part of the day. Breezy conditions are present - especially to the east of the metro areas. However, this wind is expected to gradually pick up overnight. Most area school systems are closed, along with many local governments. Additionally, the federal government will be closed. See the OPM website for details on the closure. WMATA will suspend all operations after closing tonight. There will be no Metrobus, Metrorail, or MetroAccess service tomorrow. MARC trains will also not operate. The same can be said for VRE trains and many Amtrak trains in the Northeast Corridor.